Nothing is as critical for keeping skin younger-looking, protected, and resilient as daily use of a sunscreen. This is something Paula’s Choice Skincare has embraced with every sunscreen we’ve created. If your skin is exposed to daylight, even indirectly (in the shade of a tree or through windows), it needs sunscreen. When used as directed with other sun protection measures, sunscreen decreases the risk of skin cancer and early skin ageing caused by the sun. Do you also need a moisturiser for under your sunscreen? Probably not. In addition to providing broad-spectrum protection, the best daytime moisturisers also have proven anti-ageing and hydrating formulas. You shouldn’t need a second product if the one you’ve chosen has broad-spectrum protection,is fragrance free, suitable for your skin type, and loaded with potent antioxidants and other skin-renewing ingredients. When to apply sunscreen? 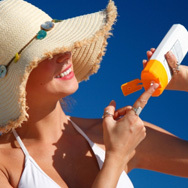 Apply sunscreen 15 to 30 minutes before you go outside and to be sure you let it absorb before you get dressed. If you get dressed immediately after applying sunscreen, much of it rubs off on your clothing, where it can’t help your skin. For daily use of regular facial moisturisers with sunscreen, the question is how can you reapply every two hours if you’re wearing makeup? Are you supposed to wash your face, reapply sunscreen, and then reapply your makeup only to do it all again in another two hours? That isn’t very practical or as it turns out, necessary if you are wearing a high enough SPF rated sunscreen and applying it LIBERALLY the first time! You can also layer sunscreen products, especially for the face, by wearing a moisturiser with SPF + a foundation with SPF, and touch-up with an SPF-rated powder. • It's even better when your foundation, BB cream, or tinted moisturiser contains sunscreen too— we love to layer sunscreen! What about relying on foundation with sunscreen on its own? That’s a fine way to get protection for your face if you apply liberally. If you don’t like that much coverage or how a liberal foundation application feels, then go back to liberally applying a facial moisturiser with sunscreen prior to makeup.